In polyandrous social insects such as honey bees, a worker’s affinity for a particular task may be genetically infl uenced and so some patrilines may have lower stimulus thresholds for commencing a task than others. We used simulation models to investigate the effects of intracolonial diversity in the task thresholds that stimulate workers to engage in heating and cooling during nest thermoregulation. First, we simulated colonies comprised of one or 15 patrilines that were engaged in heating the brood nest, and observed that single patriline colonies maintained, on average, less stable brood nest temperatures than multiple patriline colonies. Second we simulated colonies with five patrilines that were engaged in cooling their nest, recording the proportions of bees of different patrilines that engaged in nest cooling in response to changing temperatures. Both of our simulations show remarkably similar qualitative patterns to those that we have previously observed empirically. 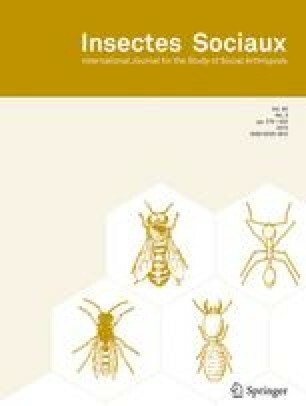 This provides further support for the hypothesis that geneticallybased variability in task thresholds among patrilines within honey bee colonies is an important contributor to the ability of colonies to precisely thermoregulate their nests, and we suggest that diversity is important for optimal expression of a range of other colony-level phenotypes. Received 17 June 2005; revised 27 October 2005; accepted 23 December 2005.